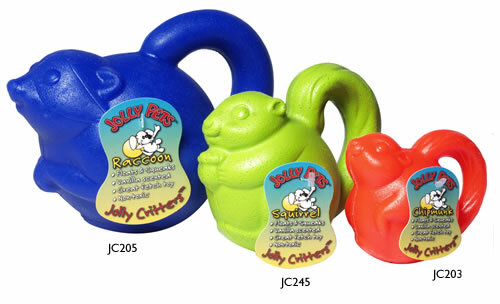 Jolly Pets - Jolly Critters II [JC205-5] - HKD208 : PetPetMaMa , The Best Products for our pets! Jolly-Pets - Jolly Critters II's , Raccoon, Squirrel and chipmunk are your pet's favorite, floatable , squeakable, fetchable, tossable, most lovable critters around. The tail forms a handle so the critters are easier to pick up and have a long lasting vanilla scent that dogs will love. Low-density , non-toxic polyethylene is puncture resistant and safe for everyone. JC205-5", JC245-4.5", JC203 - 3".Col: Blue, Green, Orange.